THINK AGAIN: Can Burundi bury the ghosts of its troubled past? Last week, a mass grave was discovered in a village in central Burundi. Builders, breaking ground for a new school, uncovered the skeletal remains of more than 1 000 people who had been hastily buried beneath the earth. Although Burundi has experienced chronic instability of late, this mass grave is not connected to recent events. Not directly, anyway – although modern Burundi continues to be haunted by the ghosts of its troubled past. According to locals, the mass grave dates back more than four decades. ‘It was in 1972 when I was a young girl studying in fifth form in primary school. The crisis began and we abandoned schools. Many people were killed and buried in this place, which remained smelly for about a whole year,’ said Rose Habonimana, speaking to IWACU News. In 1972, more than 200 000 Burundians – mostly civilians from the country’s Hutu ethnic group – were slaughtered in an extraordinarily brutal three-month period. This was Burundi’s first genocide. Now, some 45 years later, the problems that precipitated the slaughter – ethnic tensions, populist politics and social inequalities – haven’t disappeared. Experts are increasingly worried about a repeat performance. ‘We’re not saying the genocide is coming now. We are explaining that all the mechanisms, all the intention and all the bodies of the repression are ready to commit a possible genocide,’ said Florent Geel, Africa Director for the International Federation for Human Rights. In April 2015, Pierre Nkurunziza announced his intention to run for a third term as president of this tiny East African nation. This was a blatant contradiction to the spirit, if not the letter, of the Arusha Accord – the peace deal that ended the civil war, yet another dark chapter in Burundi’s history that left more than 300 000 people dead in 13 years of violence. Nkurunziza’s decision was met with strong opposition, both domestically and internationally, but the president went ahead anyway, using the full force of the state as well as informal youth militias to guarantee his victory. Since then, Nkurunziza has moved to consolidate his power by shutting down civil society and independent media, eliminating opposition, and stirring up ethnic tensions. A United Nations report found that at least 348 people died in extrajudicial killings between July 2015 and June 2016, with government or government-aligned forces mostly to blame. The international community has proved powerless to stop Nkurunziza. Repeated efforts at mediation have led nowhere, and any progress that has been made has not been implemented by Nkurunziza’s administration. Things have got so bad that the International Conference on the Great Lakes Region, the regional body tasked with mediating the political crisis, has threated to suspend Burundi unless it embraces dialogue and ends the recent spate of extrajudicial killings. 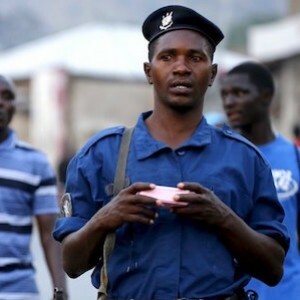 ‘There has been no significant movement on Burundi at all,’ observed Stephanie Wolters, Head of the Peace and Security Research Programme at the Institute for Security Studies. If anything, Wolters observed, Nkurunziza’s hand in the diplomatic arena has been strengthened by recent comments made by East African Community mediator, Benjamin Mkapa. At a press conference, Mkapa appeared to endorse both Nkurunziza’s third term and the controversial elections that gave it to him. ‘Those who want me to question the legitimacy of Pierre Nkurunziza are out of their mind – it is the people who have given legitimacy to the government,’ Mkapa said. So where does Burundi go from here? The options are bleak. Analysts are very concerned that the situation might degenerate further, with three scenarios possible: an escalation in extrajudicial killings that turns into a genocide; a civil war between government forces and opposition groups, some of whom have already threatened an armed rebellion; or a regional war in which other countries are also embroiled. In the latter scenario, Rwanda’s potential role is most concerning. Rwanda has already been accused of arming Burundian rebel groups, although it denies this accusation. Nkurunziza is also upping the ante. In his New Year’s Eve address, the president made a point of emphasising Burundi’s ownership of a disputed hill on the Burundi-Rwanda border. One potential lever that the international community is yet to seriously consider is Burundi’s involvement in the African Union Mission in Somalia (AMISOM). Burundi contributes 5 432 troops to the peacekeeping mission. The payments received from AMISOM by the government and soldiers provide one of the main sources of foreign currency into Burundi. Withholding those payments could substantially alter the balance of power within the armed forces, which might just push Nkurunziza into a compromise. There is no sign that this particular strategy is on the agenda of the AU or of the United Nations Security Council, however, who still need Burundi’s troops to guarantee the stability of Somalia – especially in an election year. The bottom line: Burundi’s ghosts aren’t going anywhere yet.